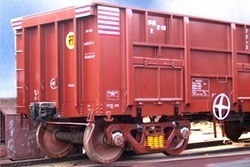 For carrying Coal, Iron Ore, Lime Stone, Dolomite and other minerals. Suitable for commodity discharge through Tipplers. - Transportation of Coal, Iron Ore, Lime Stone, Dolomite and other minerals. - Controlled and uniform commodity discharge through Tipplers. - Poly Side Bearer Pad Assembly for Wagons. - Side Bearer Pad for Casnub Bogies and BOXN Wagons Centre Buffer Coupler Draft Gear Rubber Spring for all types of Wagon. For carrying Rails, Steel Structural, Steel Coils and Containers, both Domestic and International.